Home / Celebrities / Sportswomen / Hollywood’s Award-winning Stuntwoman Luci Romberg Unveils Her Fitness Secrets! Hollywood’s Award-winning Stuntwoman Luci Romberg Unveils Her Fitness Secrets! Luci Romberg is a professional stuntwoman in Hollywood, CA. Luci is a member of the Stunt Women’s Association of Motion Pictures and Tempest Freerunning. Luci has appeared in numerous films, TV shows, commercials, and freerunning competitions (11 time female world champion in Red Bull Art of Motion). As a national champion gymnast and all-league soccer player in college, Luci’s transition into stunts was seamless. She has performed stunts on films such as the up and coming Ghostbusters reboot, Spy, Zombieland, Transformers 4, The Conjuring, and Indiana Jones 4, to name a few. She has also worked on numerous TV shows including NCIS, Criminal Minds, Suburgatory, and Raising Hope. In 2014 she won a Taurus World Stunt Award for Best Overall Stunt By a Stuntwoman for her car hit doubling Melissa McCarthy on Identity Thief. 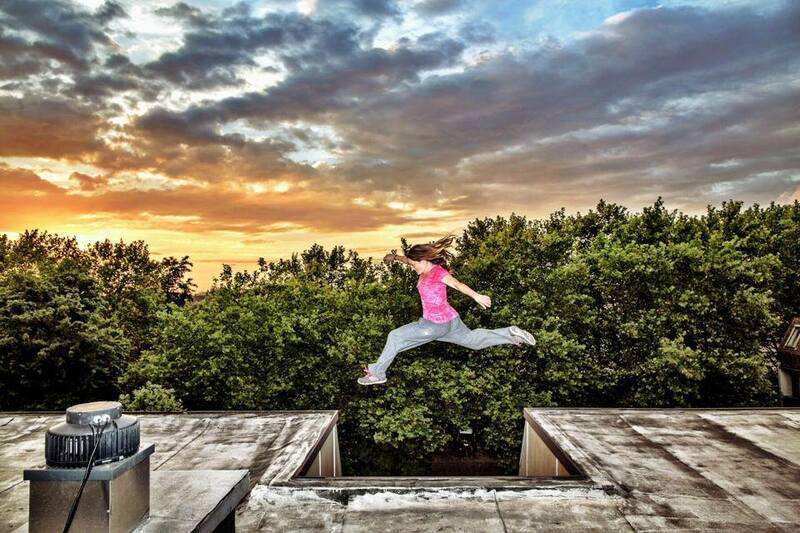 Luci Romberg, Professional Free-running Athlete & Award-winning Stuntwoman, walks us through her incredible professional journey in an exclusive interview with Namita Nayyar, President Women Fitness. You were a national champion gymnast and an all-conference soccer player in college. As a Professional Stuntwoman, you have appeared in numerous films, TV shows, commercials, and freerunning competitions. You have also won a Taurus World Stunt Award for Best Overall Stunt By a Stuntwoman in 2014. Tell us about this spectacular journey and how it all began? Both of my parents were exceptional athletes. They both played tennis in college. I grew up playing every sport I could possibly fit into my schedule. My dream was to always do two sports in college and when I got the opportunity to do soccer and gymnastics (division II National gymnastics All-Around champion -2003) I was so excited!! When I graduated from college, I didn’t know what I wanted to do with my degree so a good friend of mine, Tascha Hopkins told me about stunts. I had no idea what it entailed or how to make it happen but I grew the courage and moved to LA to pursue this crazy dream. To break into stunts is a long, frustrating process that requires a lot of hard work, dedication, and patience! But overtime I was able to figure out how to get work and now I am so fortunate to be able to be doing what I love!